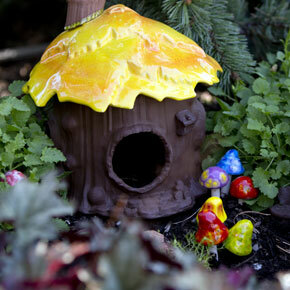 Fairy gardens are whimsical creations with small-scale plants and tiny accessories. These miniature gardens set the scene for visits from mythical fairies and elves. According to common folklore, fairies were long ago driven away from earth by humans to live in another world. Some fairies have chosen to live among us and they are very shy, mischievous creatures. Their clothes are made of flowers, making them hard to see in the garden. They delight in exploring our gardens at night as they amuse themselves by playing, moving and hiding things there! Some believe that if you watch carefully, you might see them dancing with the fireflies! A visit by fairies is thought to bring good luck. The belief in the existence of such creatures is, of course, up to you and your imagination, but there is no doubt that fairy gardens are a fun gardening project! 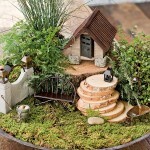 Will your fairy garden be an indoor garden? Or, will it be part of your outdoor landscape? Container fairy gardens are very popular since they can be displayed outdoors in the growing season and brought indoors during the winter months. They are very easy to plant and a fun way to get the kids involved in gardening. Container choices are limited only by your imagination, but for healthier plants, it is best to use a container with a drainage hole in the bottom (Unless, of course, you’ll be creating your fairy garden inside a terrarium). Be sure to use good quality potting mix for the container. The fun begins in choosing the hardscapes and accessories for your garden. Imagine all the things you’d love to have in your own garden, if you could. Putting those things in a miniature garden is much easier! Will you include a cottage for the fairies? How about garden benches and other furniture? Garden pools can easily be mimicked using clear or blue glass marbles. A bridge crossing over your pool would be nice. A garden path can be built with small pebbles. Small, decorative stones become boulders in your miniature landscape. A tiny arbor covered in miniature vines is a must! 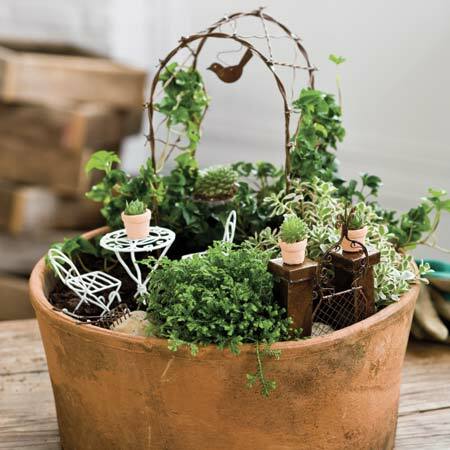 A wheelbarrow, tiny garden tools and a watering can will be needed for your fairy gardeners. Miniature birdbaths, gazing balls and picket fencing all add a touch of Victorian flare. Fairies love to play, so you might want to include an itty bitty bicycle and a swing for them to use! Lastly, don’t forget the fairy dust! 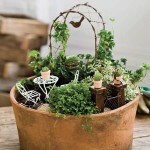 Once you’ve decided upon your accessories for the garden, it’ll be easier to decide about the plants. 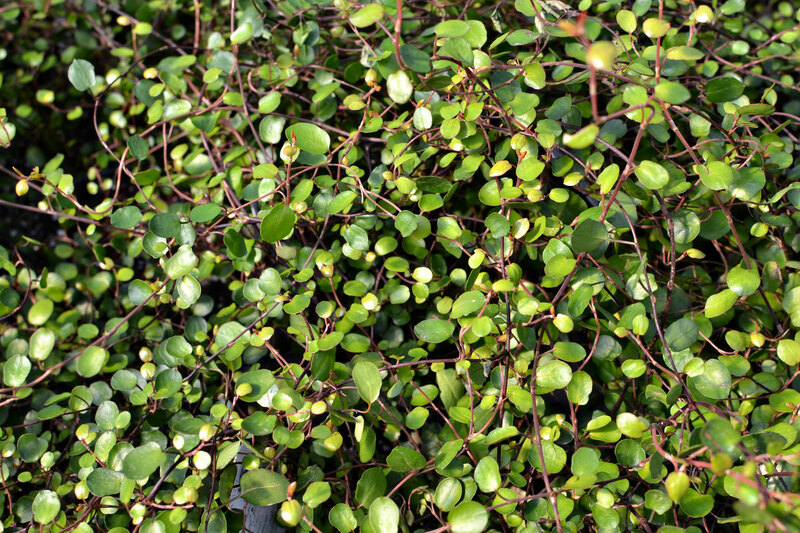 Look for dwarf or miniature types that have compatible light and water requirements. If you’ll be including a cottage, you’ll want a few small mounded plants to place around it. Flowering plants are always welcome try sweet alyssum, Mexican heather or violas. Houseplants such as waffle plant, pepperomia, pink splash or small ferns are easy to grow and maintain. For a winter hardy outdoor garden, miniature or dwarf conifers are a perfect choice as are perennials such as dianthus ‘Tiny Rubies’, armeria, hens & chicks and rock garden sedums. Angel wire vine, creeping fig, and needlepoint ivy are climbing/vining plants you might train to grow on your miniature arbor. Low growing, ground cover types such as ajuga ‘Chocolate Chip’, baby tears, creeping thyme, brass buttons, fine gold leaf sedum, Irish moss, club moss or mazus all add color and texture to the garden. If you are looking for upright forms, try cone-shaped lemon cypress, rosemary topiary, miniature conifers or annual succulents such ‘Campfire’ or ‘Princess Pine’. Remember this is a garden of whimsy, have fun choosing and arranging the plants to your liking! 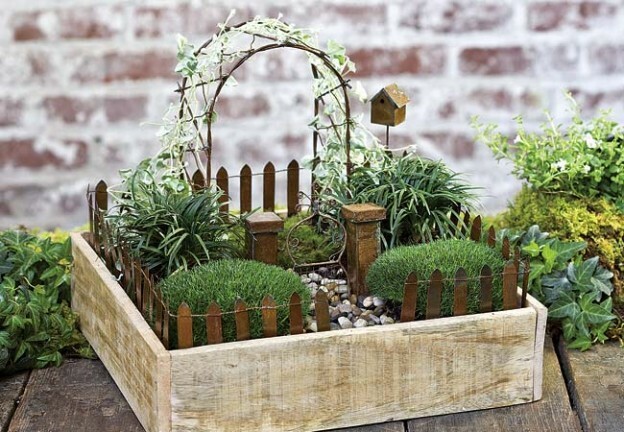 Regular care for your miniature garden is much the same as for any garden. During the hottest part of the summer, outdoor container gardens will most likely need daily watering. Fertilizing regularly during the growing season will keep the plants happy and healthy. A little trimming will be necessary to keep your miniature landscape in order. 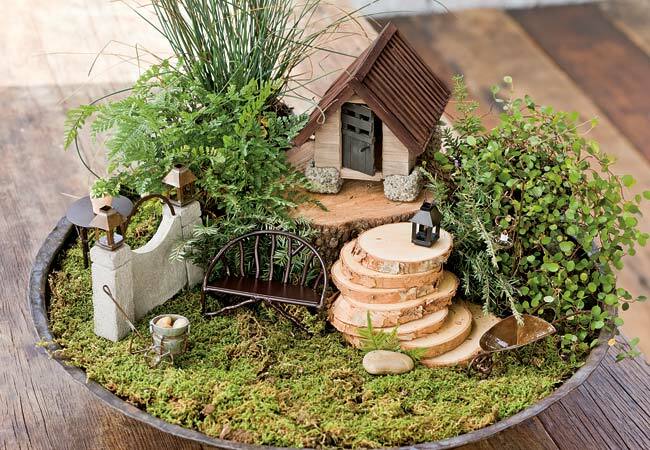 Many of the accessories, and perhaps some of the plants, in your fairy garden will not withstand winter weather, you may want to bring your fairy garden indoors to enjoy during the winter months.